If you wanted one word to describe the Wet Tropics Region – it would be DIVERSITY. The Wet Tropics region is a melting pot of variety with elevated tablelands, vast outback savannah areas and eye-achingly green coastal floodplains nestled between the foot of the highest peaks in Queensland and the Coral Sea. The region extends from the iconic Daintree forests of the north to the sugarcane land delta of the Herbert River catchment in the south and then west to the dry rangelands of the Upper Herbert. The Wet Tropics is literally where the rainforest meets the reef. This is the only place in the world where two World Heritage Areas are located directly adjacent to one another – the Wet Tropics and the Great Barrier Reef. The great diversity in the rainfall, geology, soils, topography, drainage and altitude has resulted in a complex and extremely varied spectrum of plants and animals as well as many unique landscapes crafted by nature as well as human activity. It is a region of contrasts. Over 250,000 people call the Wet Tropics home and work in a variety of industries. The tourism and primary industries sectors form the foundation of the region’s economy. Cairns is the largest urban centre in the Wet Tropics region with a population of over 150,000 people from 35 nationalities. The Wet Tropics is home to a rich, vibrant and enduring Indigenous Rainforest Cultural Heritage, handed down since millennium within the many different Traditional Language Groups. These comprise 20 Traditional Owner Tribal groupings with over 100 clans and family groupings. Over 80 legal entities represent Land People and Culture. In November 2012, the Wet Tropics World Heritage Area was re-listed to formally include its cultural values. This listing recognises that Rainforest Aboriginal heritage is unique to the Wet Tropics and is a remarkable and continuous Indigenous connection with a tropical rainforest environment. Natural resource management (NRM) refers to the management of natural resources such as land, water, soil, plants and animals, with a particular focus on how management affects the quality of life for both present and future generations. In its simplest terms, it involves anything that brings together any aspect of nature and people. Virtually everyone is involved in some way with natural resource management. Australia is divided into regions for the purpose of natural resource management. Loosely based on water catchments, across Australia there are more than 50 NRM regions. The Wet Tropics NRM Region covers about 2.2 million hectares, extending from the Daintree forests of the north to the sugarcane land delta of the Herbert River catchment in the south, and then west to the dry rangelands of Mount Garnet. 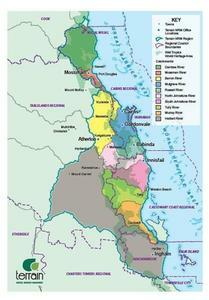 Its nine catchments flow east to the Great Barrier Reef Marine Park making it one of the 7 “Reef Regions”. The point at which water starts to flow west to the Gulf serves as our western boundary with Northern Gulf. To the north, the Bloomfield River forms our boundary with Cape York and to the south, the Herbert River is the boundary with the Burdekin Dry Tropics region. Terrain NRM is one of more than 50 not for profit Regional Bodies across Australia. We work with the community, Government and industry to look after our natural resources in the Wet Tropics region. One of Terrain’s roles is to provide planning direction, information, advice and practical support, and in particular to be the custodians of this Regional Natural Resource Management Plan.